Did you know that an exposed toothbrush can be contaminated if it is within a six foot radius of a flushed toilet? I didn’t until I received my IntelliDent Toothbrush Shield samples and started reading their literature. Immediately I began to think of how we store our tooth brushes at home and during our frequent travels. Many hotel bathrooms are small.. and… um… ewwww. We also used to pack our toothbrushes in an enclosed plastic holder often storing them wet after brushing our teeth. I never thought about how much bacteria our toothbrushes might be growing from inappropriate storage. 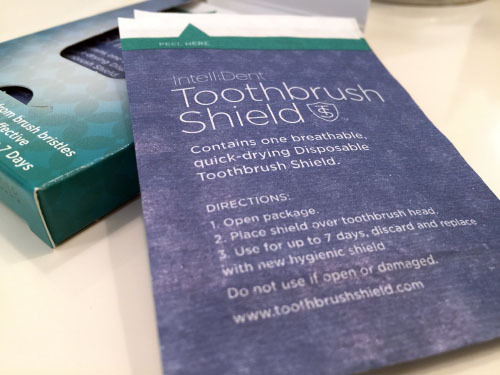 The IntelliDent Toothbrush Shield is a “breathable, quick drying shield that acts like a surgical mask for your toothbrush.” Upon opening, I noticed the shield is made of a similar material used in disposable isolation gowns and masks worn by medical professionals. The shield is designed to work by acting as a barrier to block bacteria and viral activity. It does not kill germs, it prevents contact and growth on the toothbrush. A few days after receiving our IntelliDent Toothbrush shields, our youngest son got sick. Our Doctor advised us to make sure our toothbrushes don’t touch. Thankfully we had our IntelliDent Toothbrush Shields and covered all of our toothbrushes to help keep them from getting contaminated. The toothbrush shields were laboratory tested and found to be 99.9% effective as a barrier against airborne and surface bacteria. They are disposable and effective for up to 7 days. 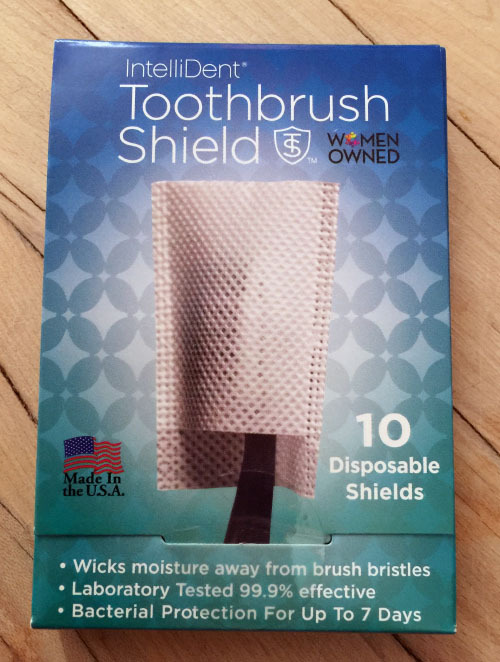 The Toothbrush Shield is specifically designed to block bacterial and viral contact. Ideal for travel, home, work and everywhere in between. I like the IntelliDent Toothbrush Shields. They are an inexpensive option for keeping your toothbrush safe from contamination when traveling or storing in a shared cup or toothbrush holder. 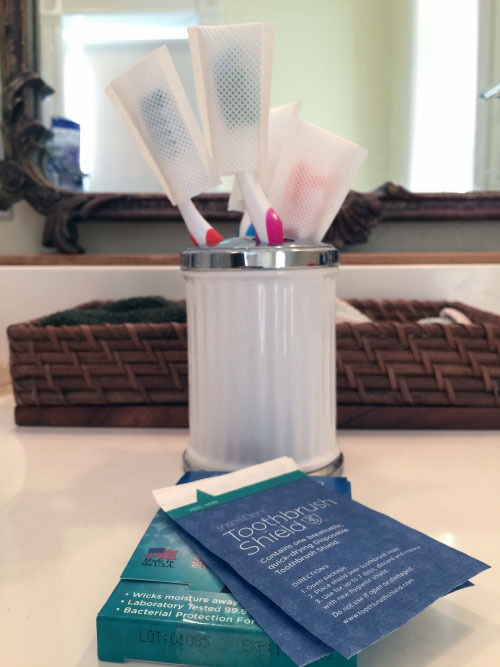 I also love that the company is woman owned and their products are made here in the U.S. I’m throwing out our plastic travel toothbrush “bacteria boxes” and sticking with the IntelliDent Toothbrush Shields on our next travel adventure. *They also make a disposable MouthGuard Shield to protect your athletic mouth guard, orthodontic retainers and most dental appliances from harmful bacteria. DISCLAIMER: This post contains affiliate links. I received a complimentary package of IntelliDent Toothbrush Shields for the purpose of review. All opinions are that of my own. This is a great idea! I’m always struggling with this issue and I store them in plastic bags when we travel. Yikes. I even bought of of the lights you stick your brush in to kill the germs and our tooth brushes would tip over inside it. It was kind of a pain. I like this idea and thanks for sharing. This is such a great idea. My husband travels a lot and uses a plastic storage bag for his toiletries. I can’t imagine how much bacteria must be growing in that bag. He could benefit from these shields! Hmmm, what a great idea! My kids have a plastic cover that they put on their toothbrushes (when they remember), but it gets pretty gross when not looked after properly (and probably creates even more germs!?). So I see these coming in handy – especially when travelling. Probably not available in Canada yet, but I will keep my eyes open. Thanks for the information! What a great idea. I always have trouble while traveling and I end up using new toothbrushes every time we go out. I am surely going to apply this idea now on. I’m intrigued by these! Thanks for sharing. Those are a great idea! We dont travel a lot but i throw ours in baggies and it is bulky. Family Friendly Travel Destinations, Lifestyle, Foodie/Wine, Kids & Cool Gadgets.